The IUVS beamline is dedicated to the study of inelastic scattering with ultraviolet radiation, in a time-space domain not accessible at present by other facilities. In the inelastic scattering process, an incident photon, with energy Ei and momentum Ki interacts with the matter. In this interaction the photons can be diffused, with energy Es and momentum Ks. Here q=Ks-Ki is called “exchanged moment” and is of considerable importance in the study of inelastic diffusion. We refer to “inelastic scattering” when there is an energy variation. The peculiarity of IUVS is the specific kinematic region that can be investigated. IUVS beamline delivers photons with incident energy between 5 and 11 eV. The incident photons that are inelastically diffused by the sample can be analysed by exploiting the two different and complementary experimental set-up available on the beamline, i.e. 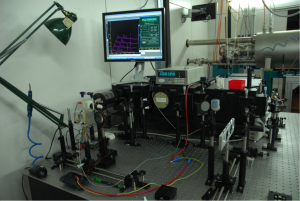 UV Brillouin and UV Resonant Raman scattering instruments, in order to probe both the acoustic and optical phonons propagating in the system. This allows to acquire information about the structure and dynamics of the constituent matter over diﬀerent length scales through the analysis of its collective and molecular vibrations. We invite users and collabrators to discuss thier proposals with the beamline local contacts well in advance before the submission deadline. This is crucial for a careful assesment of the experiment feasibility and may lead to improvements in the proposed experimental plan. In a restricted number of cases, when doubts arise about the suitability of your samples (sample absorption etc), it may be possible for you to arrange a test. Our website provides a wealth of informaiton on experiment feasibilty and proposal submission.